U Shape Travel Lift Includes Cabin Travel Lift Remote Control Travel Lift Light Duty Travel Lift Heavy Duty Travel Lift Electric Travel Lift Hydraulic Travel Lift Choose Suitable Boat Hoist For Boat Lifting! U shape travel lift has reasonable design. 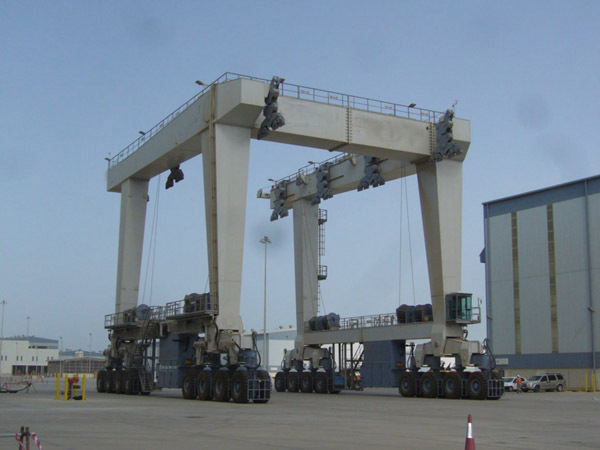 This kind of gantry crane can lift boat that is higher than machine itself. This makes travel lift have large loading capacity and high efficiency. According to different operation ways, it includes cabin control travel lift and remote control travel lift. 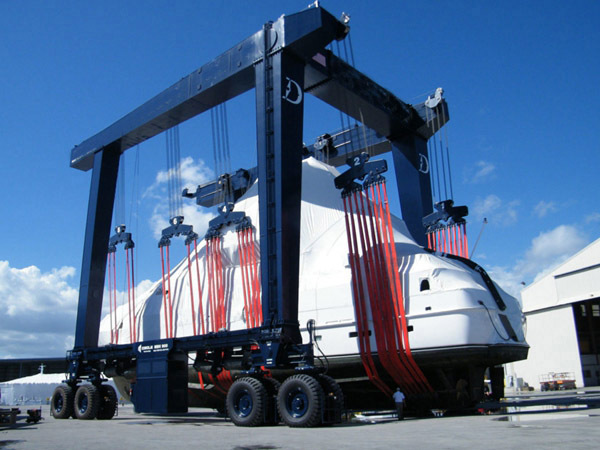 For lifting capacity, it can be divided into small boat hoist and large boat hoist. The former type is suitable for light duty, such as 10 ton mobile travel lift, 25 ton marine gantry crane, 50 ton boat hoist. The latter type is suitable for heavy duty, such as 100 ton construction travel lift, 500 ton large boat hoist, and 1000 ton vessel travel lift for sale. 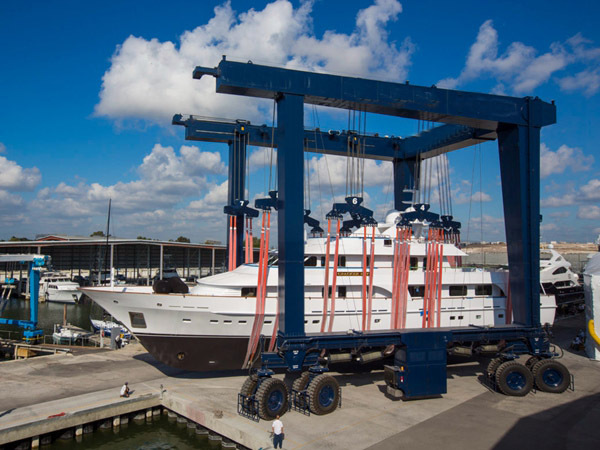 Ellsen Group, a reliable and professional marine boat hoist manufacturer, provides top quality travel lifts with reasonable price, such as cheap travel lift for sale, ISO approval marine travel lift, safe driving steady travel lift, cabin control boat hoist and remote control boat hoist, all-wheel steering travel lift. All these devices are designed and produced according to national standards. For any requirement, Ellsen provides customized service! Reliable quality, factory price, complete service! Ellsen travel lift is a fantastic service! Where to buy suitable U shape travel lift? U type travel lift is a necessary device for lifting boat. It can save energy and increase efficiency. 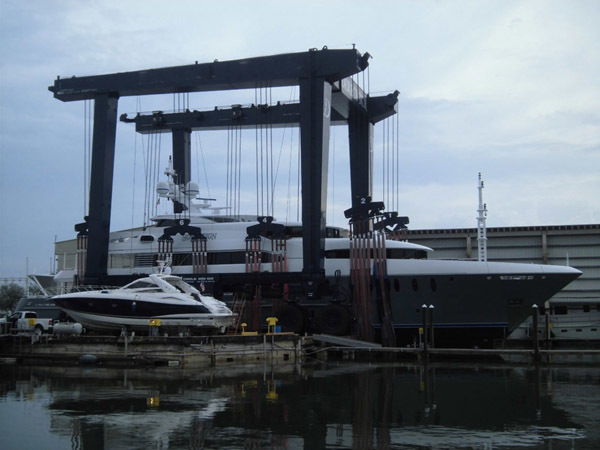 Where to purchase cost-effective U style boat hoist? First, rely on google. Search key words such as “travel lift”, “boat hoist”, “marine travel hoist”, “construction travel lift” in google, the page shows many choices, click the links those ranks top, and find a reliable manufacturer or supplier. Second, get advice from friends. One friend once bought travel lift from a supplier, and felt satisfied with it. This proves that the product is reliable through time and practice. Customers can trust this manufacturer. Third, choose a local supplier. Customers can visit the factory and producing line by himself. Careful observation and comparison can help make wise decision. What is qualified travel lift slings? 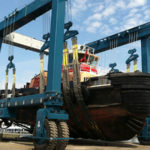 Ellsen has been building robust, low maintenance and economical mobile marine lifts since the 1980’s. 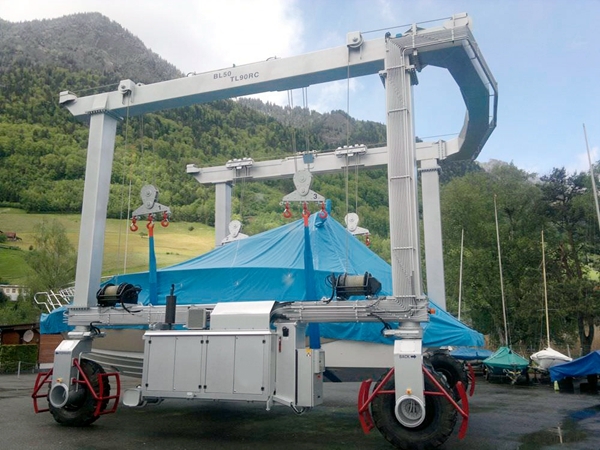 These machines, also known as travel lifts or mobile boat hoists, offer a safe and efficient way to launch and retrieve vessels for maintenance or storage. Our high strength, low alloy tube frame design, which is open at one end and has an equalizing joint on the other to relieve stresses, will provide decades of trouble free service, even if your yard is not perfectly flat. Ackerman steering provides a very tight turning radius giving the best possible maneuverability in your yard. All functions are controlled from a dash board style control panel which is mounted in a gondola control station positioned for the best operator visibility. A digital dash with load gauges, engine information, diagnostic and service tools is standard in all of our machines. The four lift point functions can be simultaneously or independently controlled and as the vessel clears the water, the load gauges will give the operator an instant and accurate measurement of the actual weight of the vessel. Reliable Caterpillar diesel power comes standard coupled to high quality hydraulic pumps, cylinders, winches, and planetary drives. A number of options are available in order to configure your travel lift to meet your exact requirements. Full radio remote control can increase both the safety and efficiency of your operation. The remote gives the operator the ability to control all the functions of the machine including the engine controls, and includes digital load gauges to ensure operator awareness at all times. Other options include hydraulic sling positioners, night and cold weather packages, and four-wheel steering for maximum maneuverability. Ellsen high quality and thoughtful design are built into each mobile lift. We can provide you with an elegantly simple and economical lift beam style machine with manual sling positioning, or proven options such as hydraulic sling positioning, four wheel drive, four wheel steer and radio remote control. Please contact us to discuss how we can put our decades of experience in boat handling to work for you with a marine mobile lift.